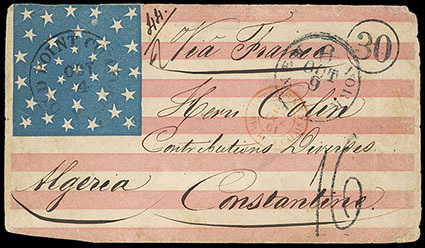 (Flag) 34-Star American Flag, red and blue allover patriotic design on 1861 cover to Constantine, Algeria endorsed "Via France", with "Old Point Comfort, Va., Oct 4" origin cds in star field, "New York, 6, Oct 9" cds and "30" in circle rate handstamp, red Calais transit and "16" due handstamp, reverse with Paris transit and receiving date stamps; cover edge wear and small portions of backflap missing, F.-V.F., a wonderful destination of an allover patriotic design. 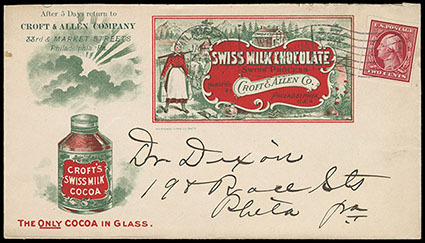 (Food & Drink) Croft's Swiss Milk Cocoa, red and green illustrated ad design showing Milk Chocolate Bottle and Milk Maiden Scene, on cover franked with 2¢ red, imperf tied by 1911 Philadelphia, Pa. machine postmark, Very Fine, quite rare. Scott No. 344 Estimate $200 - 300. 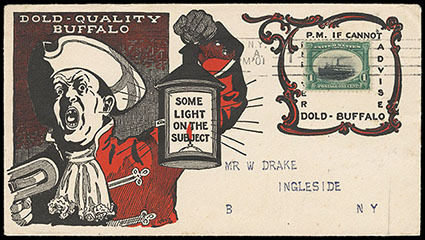 (Food & Drink) Dold - Quality, Buffalo, red and black design showing Colonial Town Crier and Stamp Collar, on unsealed cover franked with 1901, 1¢ Pan-Am tied by 1901 Buffalo, N.Y. machine postmark, Very Fine. Scott No. 294 Estimate $150 - 200. 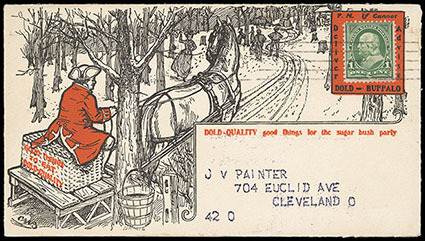 (Food & Drink) Dold - Quality, Good Things For the Sugar Bush Party, black and orange ad design showing One Horse Sled Going to Sugar Bush Party and Stamp Collar, on unsealed cover franked with 1¢ Bureau tied by 1901 Buffalo machine postmark, Very Fine. 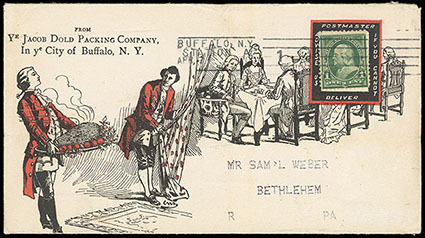 (Food & Drink) Dold Packing Co. (From Ye Jacob), In Ye City of Buffalo, N.Y., red and black illustrated design showing Colonial Servants Bring Plated Ham to Dinner Table and Stamp Collar, on cover franked with 1¢ Bureau tied by 1900 Buffalo, N.Y. machine cancel, Very Fine. 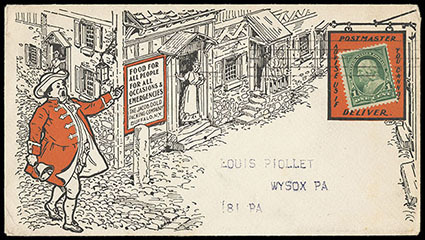 (Food & Drink) Dold Packing Co., Food for all People, For all Occasions & Emergencies, multicolored ad design showing Town Crier Scene and Sign Stamp Collar, on unsealed cover franked with 1¢ Bureau tied by 1900 Buffalo, N.H. machine postmark, Very Fine and choice. 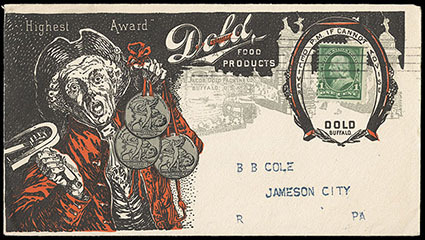 (Food & Drink) Dold Quality Food Products, Highest Award, multicolored ad design showing Town Crier Holding Pan-American Exposition Medals and Stamp Collar, on cover franked with 1¢ Bureau tied by 1901 Buffalo, N.H. machine postmark, reverse with Expo Medals and ad text, Extremely Fine. 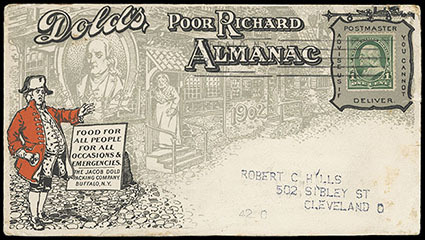 (Food & Drink) Dold's Poor Richard Almanac, orange, black and gray design showing Colonial Town Crier Scene, Benjamin Franklin Portrait and Stamp Collar, on cover franked with 1¢ Bureau tied by 1902 Buffalo, N.Y. machine postmark; minor edge wear at right, Very Fine, scarce design. 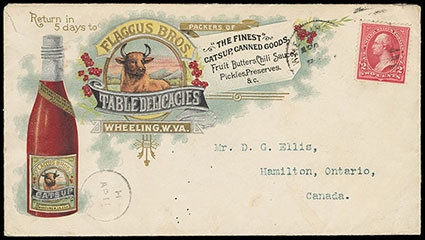 (Food & Drink) Flaggus Bros., Table Delicacies, most attractive multicolor advertising designs with intricate printing and embossing showing Ketchup Bottle with Flaggus Bros. "Steer" Logo, on 1896 cover to Canada, franked with 2¢ Bureau canceled by Wheeling, W. Va. duplex cancel, reverse with advertising text; cover tear at upper left, Very Fine. 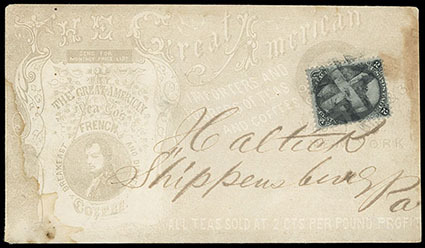 (Food & Drink) The Great American Tea Company, New York, three different allover shaded ad covers each franked with 1873, 2¢ black; two illustrated with one showing Building View and other with Napoleon Portrait (cover stains), F.-V.F. overall. Scott No. 73 Estimate $150 - 200.